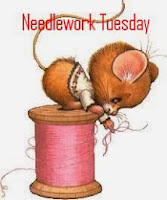 Books and Quilts: Needlework Tuesday - The Secret project reveal. Great work! Love the cables. It everything a blanket should be: squishy, cuddly, and lovely colour. This reminds me that I don't knit enough bulky pieces. I'm putting one on my to-do list right now.